Let’s be real. I don’t think you could go wrong with ANY nut butter. Nut butters are a great source of protein and healthy unsaturated fats. Monounsaturated and polyunsaturated fatty acids are known for their significant role in lowering LDL cholesterol (“the bad cholesterol”) and also lowering triglyceride levels. Therefore, nuts and seeds are extremely beneficial to your heart health; preventing heart disease, type II diabetes, and other health issues. I absolutely LOVE nut butters before and after exercise. One tbsp of almond butter or peanut butter before a long run has a substantial satiety value (feeling of fullness) from its protein content. It provides me with enough energy throughout the whole exercise. Due to their high fat and protein content, nut butters have a slow release in the gut and have the ability to maintain stable blood sugars. Between peanuts and almonds, the difference in protein content and healthy fat content (the macronutrients) is minimal. Carbohydrate content between the two butters are the same at 3g per tbsp. Peanut butter/peanuts contain the slightest amount more of saturated fats versus almond butter/almonds but it is hardly noticeable. However, the difference between the two lies within the smaller micronutrient content (and of course the price!!! Almond butter is almost 3x the price of peanut). 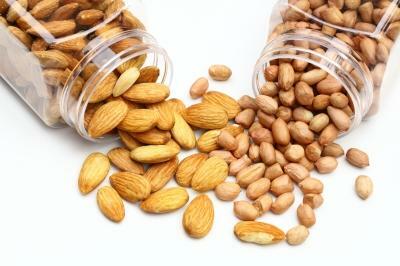 Almonds contain a more substantial amount of Vitamin E, calcium, iron, potassium and magnesium in comparison to peanuts. Vitamin E is important to our bodies for maintaining a healthy immune system and healthy bodily processes. Additionally, vitamin E plays a role as an antioxidant and protects our cells from free radicals. One common concern as to why some people may avoid peanuts is due to their risk of Aflatoxins. Aflatoxins are produced by a fungi (Aspergillus flavus). This fungi is common to crops that have grown in conditions of high humidity and temperature. Aflatoxins manly effect the liver and may increase risk of liver cancer. HOWEVER, Aflatoxin in peanut butters, and other at risk foods, is regulated and inspected by the FDA/USDA to ensure safe levels are always met for safe food consumption.